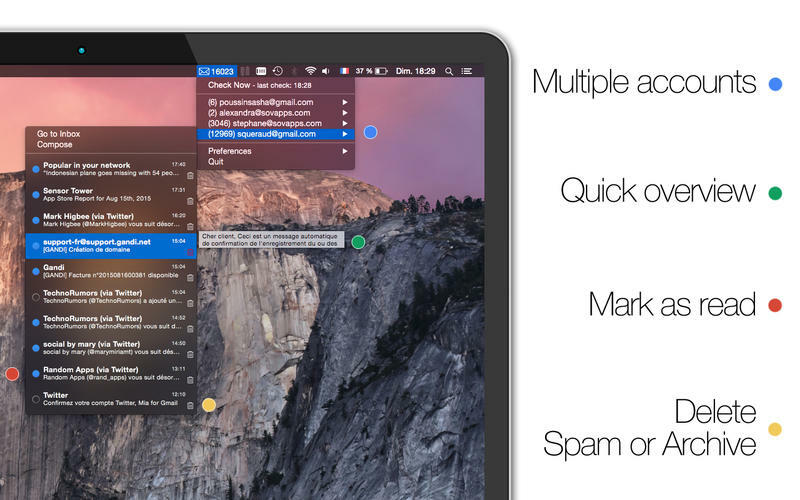 A desktop email client for your Mac, without a browser ! * Read and compose your emails without a browser (attachment files supported). * Multiple accounts support (with the Premium version upgrade). * Secured: Mia for Gmail is using the oauth 2.0 protocol. * Mark as read, delete, archive or spam directly from the application. * Choose your default browser for each account (if ever you prefer to read/compose your emails from your browser). Note: Mia for Gmail is a 3rd party application for Gmail. New: the ‘primary’ label to the label list. Improved: the compose window takes immediatly the focus, you will see the blinking cursor. And when hitting the return key, it will really create a new blank line instead of continuing writing in the same block. It should be the same behavior as the one in gmail, allowing to make clear in-line answers.